I love, love, love mint Oreo ice cream and milkshakes. Have you ever tried the mint Oreo milkshake from Cookout? It's amazing. Well, actually, anything with mint and Oreos rocks my world. This love affair has now extended into my baking ... 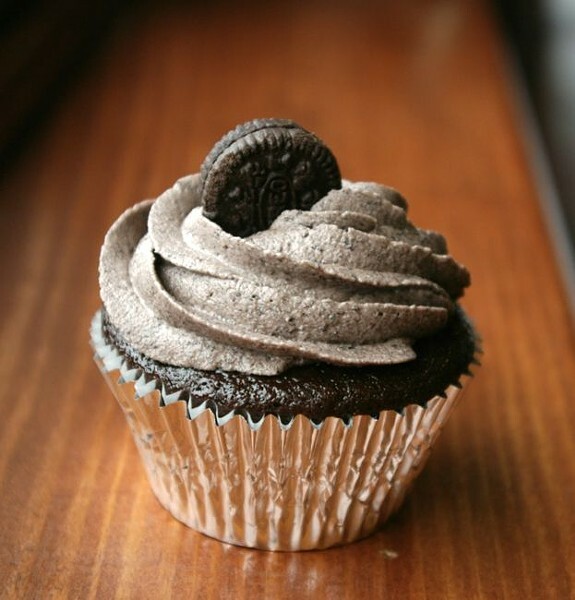 I created these chocolate cupcakes filled with ganache, topped with a mint Oreo buttercream. For the base, I used Cook's Illustrated's recipe for Ultimate Chocolate Cupcakes. CI never lets me down and these cupcakes were no exception. These chocolate cupcakes were delicious. I highly recommend it. What's interesting is the recipe calls for bread flour, which makes for a sturdier cupcake that can hold its own under a mound of frosting. Ahh ... those CI people are so smart! Most chocolate cakes work well as large cakes, but not cupcakes. The soft and airy texture of cupcakes made from a regular chocolate cake recipe doesn't make for a good base for all the tasty buttercream. What's even nicer about this recipe is that it includes a dollop of chocolate ganache dropped in the middle of each cupcake before baking so you get a chocolate truffle-like surprise when you bite into a cupcake. The frosting for the cupcakes seriously tastes like ice cream (especially if you chill the cupcakes). To make it, I whipped Oreo crumbs into a fluffy buttercream frosting and threw in a good dose of peppermint extract. I wonder what would happen if I threw a cupcake into a blender with some ice cream and milk. Chocolate cupcake and mint Oreo frosting milkshake, anyone? Place chocolate, cream, and confectioners sugar in medium -microwave-safe bowl. Heat in microwave on high power until mixture is warm to touch, 20 to 30 seconds. Whisk until smooth; transfer bowl to refrigerator and let stand until just chilled, no longer than 30 minutes. 1. Adjust oven rack to middle position and heat oven to 350 degrees. Line -standard-size muffin pan (cups have ½-cup capacity) with baking-cup liners. Place chocolate and cocoa in medium bowl. Pour hot coffee over mixture and whisk until smooth. Set in refrigerator to cool completely, about 20 minutes. Whisk flour, sugar, salt, and baking soda together in medium bowl; set aside. 2. Whisk oil, eggs, vinegar, and vanilla into cooled chocolate-cocoa mixture until smooth. Add flour mixture and whisk until smooth. 3. Divide batter evenly among muffin pan cups. Place one slightly rounded teaspoon ganache filling on top of each cupcake. Bake until cupcakes are set and just firm to touch, 17 to 19 minutes. Cool cupcakes in muffin pan on wire rack until cool enough to handle, about 10 minutes. Carefully lift each cupcake from muffin pan and set on wire rack. Cool to room temperature before frosting, about 1 hour. Garnish with Mini Oreos, if desired. 1. Cream the butter and shortening in the bowl of an electric or stand mixer. 2. Add the vanilla and peppermint extracts and combine well. 3. Begin adding in the sugar and mixing thoroughly after each addition. Add enough to reach desired sweetness. (Remember the Oreo crumbs will add more sweetness too). Mix in Oreo crumbs. one tablespoon at a time, combining very well after each addition (mixer on medium-high to high speed) until you reach the desired consistency.